Lynden Transport was awarded its sixth consecutive No. 1 ranking and its 22nd overall award in the 35th annual Logistics Management Quest for Quality Awards, receiving the highest scores among Less-than-Truckload (LTL) western regional carriers in the on-time performance and information technology categories and topping the overall weighted scores. Lynden International achieved strong results in the air freight category, earning its 16th Quest for Quality award. “Our employees are the key ingredient in our excellent customer service and our many years of Quest for Quality Awards,” says Lynden International President John Kaloper. “The air freight industry is challenging and competitive and we strive to provide the best on-time performance, service and value." For more than three decades, Logistics Management’s Quest for Quality Awards has been regarded as the most important measure of customer satisfaction and performance excellence in the transportation and logistics industry. The results are the culmination of a six-month research project conducted by Peerless Research Group. Thousands of ballots are cast and counted to determine the leaders across a number of critical criteria, including: on-time performance, equipment & operations, value, information technology and customer service. To be a winner, a company had to receive at least five percent of the category vote. Lynden Transport was awarded its fifth consecutive No. 1 ranking and its 21st overall Quest for Quality Award in the 2017 awards issued by Logistics Management magazine. Lynden Transport received the highest scores among Less-than-Truckload (LTL) western regional carriers in the on-time performance, value, and equipment & operations categories and topped the overall weighted scores. 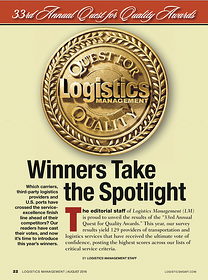 “What makes the Quest for Quality Awards stand out in the market is the fact that the winners are determined by the readers of Logistics Management - the buyers of logistics and transportation services who put these carriers and service providers to work around the clock and around the globe,” said Michael Levans, Group Editorial Director of Peerless Media, LLC., the publisher of Logistics Management. Logistics Management’s Annual Quest for Quality Awards is the culmination of a six-month research project conducted by Peerless Research Group. For more than three decades, Quest for Quality has been regarded in the transportation and logistics industry as the most important measure of customer satisfaction and performance excellence. This year 5,437 logistics and supply chain decision makers cast their votes. Lynden Transport was awarded its fourth consecutive No. 1 ranking and its 20th overall Quest for Quality Award in the 2016 awards issued by Logistics Management magazine. Lynden International also earned a No. 1 ranking for the second consecutive year and its 15th Quest for Quality Award. Lynden Transport ranked highest among Less-than-Truckload (LTL) western regional carriers and Lynden International was the winner among Airfreight Forwarders. Lynden Transport received the highest scores in the information technology, customer service, and equipment & operations categories and topped the overall weighted scores. Lynden International was rated highest in the performance, value and customer service categories with a weighted score well above the other national and international airfreight forwarders. "When you consider the challenging environment for transportation and logistics service providers, earning a No. 1 ranking is quite an accomplishment. We are very proud to be at the top year after year," says Lynden Transport President Paul Grimaldi. "We celebrate this achievement with our dedicated employees who provide quality service to our customers each day." "We thank our customers for recognizing us again and our employees for taking good care of our customers and earning a top ranking for a second consecutive year," says Lynden International President John Kaloper. "This prestigious award reflects our commitment to providing quality service, on-time performance and value to our customers." For more than three decades, Logistics Management's Quest for Quality Award has been regarded as the most important measure of customer satisfaction and performance excellence in the transportation and logistics industry. The results are the culmination of a six-month survey of 4,725 ballots cast for the 'best of the best' in service across a number of critical criteria, including: on-time performance, equipment & operations, value, information technology and customer service. To be a winner, a company had to receive at least five percent of the category vote. Voting is by invitation only and the voter must have had experience with that particular provider at some point over the past year. 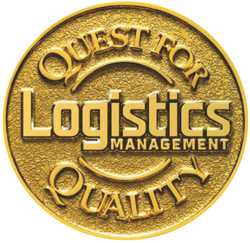 Lynden Transport and Lynden International earned first place in the Less-than-Truckload (LTL) regional carriers and Airfreight Forwarders categories in Logistics Management magazine’s 32nd annual Quest for Quality Awards. It is the third consecutive year Lynden Transport has taken the No. 1 spot. Lynden Transport received the highest rankings in the customer service, information technology and equipment & operations categories and topped all other overall weighted scores. Lynden International/Lynden Air Freight was rated highest in the value and equipment & operations categories and finished in first place among 23 service providers. Lynden Transport has earned 19 Quest for Quality Awards. Each year, thousands of transportation and logistics customers are asked to evaluate service providers in the following categories: on-time performance, equipment & operations, value, information technology and customer service. This year the research group received 4,649 total responses. To be a “winner,” a company had to receive at least five percent of the category vote. The results provide customers with a definitive ranking of companies by category and those that finished above average. Since its creation in 1985, the Quest for Quality Awards program is widely recognized as the transportation industry’s most important measure of customer satisfaction and performance excellence. Voting is by invitation only and the voter must have had experience with that particular provider at some point over the past year. Lynden Transport earned the top score among Less-than-Truckload (LTL) carriers in the Western Region in Logistics Management magazine’s 31st annual Quest for Quality Awards. Lynden swept the category, earning No. 1 rankings for on-time performance, customer service, equipment and operations and information technology. Its total weighted score of 53.01 was the highest among all carriers in the national LTL sectors of Western, Northeast, South/South Central and Midwest/North Central. This is the second year Lynden Transport earned the No. 1 ranking for on-time performance in the Western Region. The Quest for Quality Awards go straight to the customers, asking shippers to evaluate providers on the following criteria: on-time performance, equipment and operations, value, information technology and customer service. This year the research group received 7,451 total responses—1,272 more than last year. In order to be a “winner,” a company had to receive at least five percent of the category vote. The result offers the logistics market a crystal clear look at not only the overall winner in any given category, but a list of companies that finished above the average. 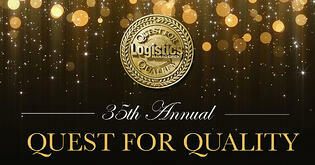 With this year’s award, Lynden Transport has received 18 Quest for Quality Awards. For more than three decades, Quest for Quality has been the transportation industry’s most important measure of customer satisfaction and performance excellence. Voting is by invitation only and the voter must have had experience with that particular provider at some point over the past year. Lynden Transport once again was voted a top Less-than-Truckload (LTL) carrier in the Western Region in Logistics Management magazine's 30th annual Quest for Quality Awards. Lynden earned the No. 1 ranking for on-time performance and was ranked second overall among the top four competitors. The award asks shippers to evaluate providers on the following criteria: on-time performance, equipment and operations, value, information technology and customer service. 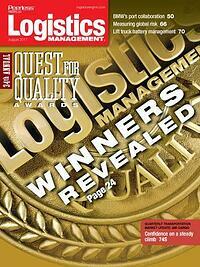 With this year's award, Lynden Transport has received 17 Quest for Quality Awards. "The Regional LTL category continues to represent some of the most forward-thinking carriers in trucking," wrote Logistics Management editors in the August 2013 issue. "Competition is stiff, so every regional carrier is looking to get a step ahead by improving tracking technology and getting closer to shipper customers through more consultative customer service. These companies have earned the ultimate vote of shipper confidence by receiving the highest scores across the service-performance criteria." According to Lynden Transport President Paul Grimaldi, Lynden has made recent technology enhancements to improve operations and provide quality information for both internal and external customers. 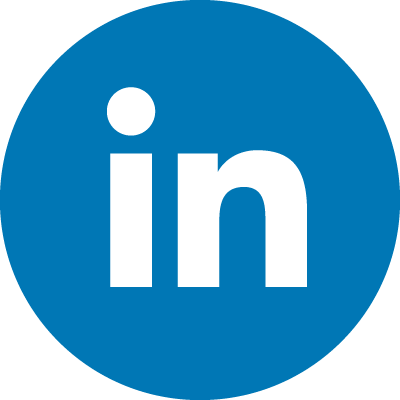 "We are proud to be part of this elite group of transportation providers each year. Receiving this award is confirmation that our improvements are making a difference to our customers," Grimaldi says. "The Quest for Quality Awards are the gold standard for customer satisfaction and performance. What makes this award stand out for us is that winners are selected by buyers of logistics services who put transportation providers to work every day all over the world." For 30 years, Quest for Quality has been the transportation industry's most important measure of customer satisfaction and performance excellence. Voting is by invitation only and the voter must have had experience with that particular provider at some point over the past year. This year, more than 6,000 responses were logged over six months to produce the study results. Lynden Transport is best known for shipping to Alaska from the lower 48 states and Canada. The Lynden family of companies' combined capabilities include: truckload and less-than-truckload freight to Alaska, scheduled and charter barges, rail barges, intermodal bulk chemical hauls, scheduled and chartered air freighters, domestic and international shipping via air and ocean forwarding, customs brokerage, trade show shipping, remote site construction, sanitary bulk commodities hauling and multi-modal logistics. 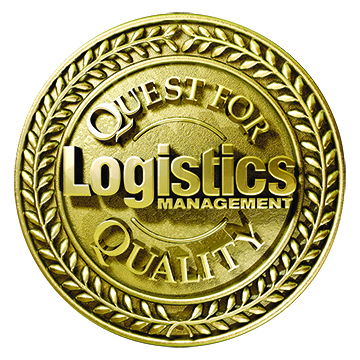 Lynden International was voted the top freight forwarder in Logistics Management magazine's 28th annual Quest for Quality Awards. Lynden Transport earned a third place ranking among Less-than-Truckload (LTL) carriers for the Western Region. Lynden International has now placed in the top five freight forwarders for 12 consecutive years, and Lynden Transport has received 15 Quest for Quality Awards (see Lynden's results in the 2010 Quest for Quality Awards). Lynden International received the highest score for on-time performance and high marks for value and customer service. Lynden Transport received the highest score for information technology and one of the highest scores for equipment and operations. Lynden Transport is best known for shipping freight to Alaska from the lower 48 states and Canada. For almost 30 years, Quest for Quality has been the transportation industry's premier benchmark study for customer satisfaction and performance excellence. Shippers grade carriers on customer service, on-time performance, value, equipment and operations and information technology during the previous year. This year, 4,575 logistics and supply chain decision-makers cast their votes for 111 providers of transportation and logistics services. 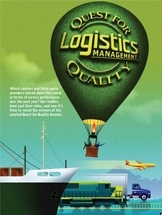 According to Michael Levans of Logistics Management Magazine, "When you consider the operating environment in which carriers and 3PLs found themselves operating in over the past 12 months, the editorial staff agrees that securing shipper faith and walking away with a Quest for Quality Award in 2011 is a tremendous achievement." "We are extremely proud of our first-place finish and on-time performance score this year. Our industry revolves around deadlines, and we work hard to make sure that customers' freight is exactly where it needs to be when it needs to be there," says Lynden International President Dave Richardson. "We have launched a company initiative this year to enhance our customer experience and will use the scores from this coveted award to help us get a more accurate view of our service." "We are honored, once again, to receive a Quest for Quality Award and share the top ranking with our competitors," says Lynden Transport President Jim Beck. "We received the highest score for Information Technology this year which means that our investments in our EZ Commerce System are paying off for customers. EZ Commerce allows customers to manage the freight shipping process online by requesting rate quotes and pickups, track and trace shipments and generate reports and invoices. We have also added GPS tracking and other programs like Dynamic Routing to stay on the cutting edge of developing technology." For the fifth year in a row shippers have voted Lynden Transport the top LTL carrier for the Western Region in Logistics Management magazine’s 27th annual Quest for Quality Awards. Lynden Air Freight/Lynden International earned a fourth place ranking among 10 freight forwarders. Lynden Transport has now received 14 annual Quest for Quality awards and Lynden International has placed in the top five for 11 consecutive years. Lynden Transport led the regional LTL pack overall with the highest rankings in the information technology, customer service and equipment and operations categories. Lynden Transport is best known for shipping to Alaska from the lower 48 states and Canada.